Jim and Teena are next door neighbors. 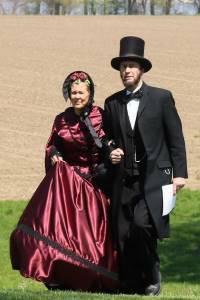 Jim started portraying Abraham and knew that Teena would be a great Mary Lincoln. Happily she agreed and they have been a team for 10 years. Jim and Teena’s presentations are more like a conversation between a husband and wife. 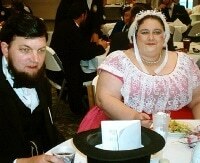 They portray the Lincolns as a loving couple with high aspirations. 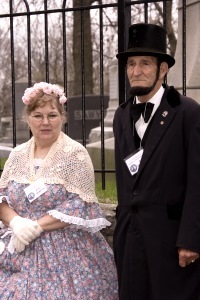 They have portrayed the Lincolns at schools, churches and community celebrations. The presentations are about an hour and they both will answer questions at the end. 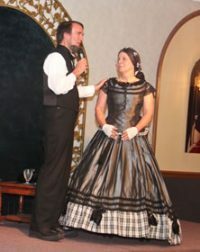 In addition to appearing together for Victorian Balls, Teas and Lincoln Presentations, the Voehls provide a growing number of one-act plays including “Lincoln’s Happiest Day”, “Childhood Memories”, “Log Cabin to White House”, “Thanksgiving” and “Christmas in the Lincoln White House” followed by spontaneous Question and Answer opportunities. 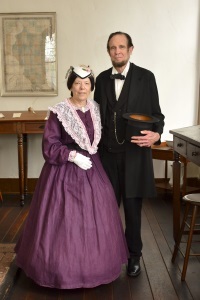 Abraham and Mary Lincoln: The Long and the Short of It — a theatrical presentation set in the White House in 1861(for student or family audiences) or after Lincoln’s assassination (for adult audiences), The Lincolns tell stories of their early lives and the challenges they faced during this turbulent time in our country’s history. 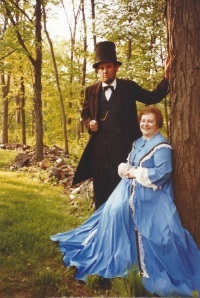 The Woods have been researching and portraying the Lincolns since 1995. 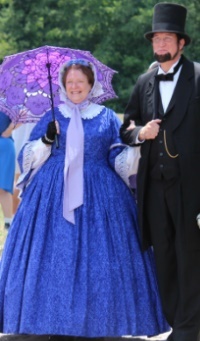 Send an email to be put on mailing list or check their Facebook page for events listings.